There's a rich mix of premium hardware and attention to detail in this picture palace designed by UK installer Cyberhomes. 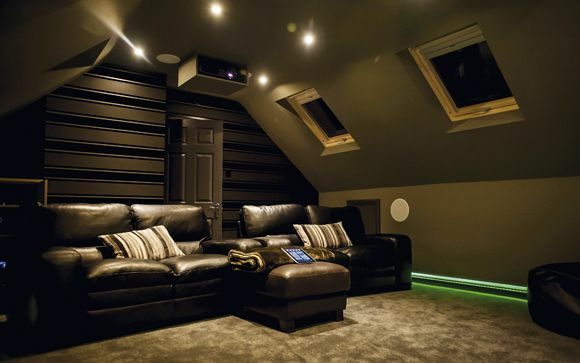 The owner, we're told, wanted 'the ultimate home cinema room' and that's what he got, not to mention a space crowned Best Home Cinema (£120,000-£340,000) at the recent CEDIA Awards. A StormAudio ISP 3D 16 Elite processor handles next-gen audio decoding for the room's 9.1.6-channel system. All speakers are from James Loudspeaker, fitted in-wall/in-ceiling. Power comes from a 16-channel StormAudio amplifier, with additional rack-mounted grunt for the quartet of subwoofers. For visuals, the initial plan was for a Digital Projection E-Vision Laser 4K projector (7,500 Lumens, single-chip DLP) to be used, but after a comparison with the same brand's 3-chip, 12,500 Lumens HIGHlite beamer, the owner demanded the higher-spec model. Next on the kit list was a Lumagen Radiance Pro 4444 processor, which introduces HDR (including Dolby Vision and HDR10) playout to the system, making use of the projector's inherent brightness. Film and TV from assorted sources (racked in a boot room) are given cinematic impact by the 140in Screen Research projector screen.